United States, Russia (Ural Mountains), Sri Lanka (Ceylon), Zimbabwe (Rhodesia), Brazil, Madagascar, Italy. Named after the Russian Czar, Alexander II, alexandrite is the gemstone most noted for it's color changing abilities. Colors are greenish outdoors, and reddish to violet under artificial light. Alexandrite is extremely rare. Look out for alexandrite which is too clean, or at a price which seems too low, it's probably synthetic. Natural alexandrite rarely exceeds 2 carats. Can be confused with synthetic alexandrite, or synthetic color change corundum. Pearl, moonstone and alexandrite are the birthstones of the month of June. Photographs have been retouched to show the approximate color change from indoors to outdoors. 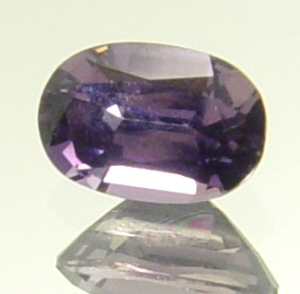 Alexandrite is a member of the Chrysoberyl gemstone family. AA Green to greenish blue, slightly included, moderate to medium color change, 70%. A Light green to greenish blue, included, weak to low color change, 30 to 50%.